Got bad news from my knee guy. Looks like I will be hiking minimal elevation gain for the foreseeable future. 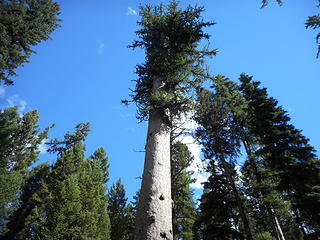 Not hiking makes me crazy, so I've decided I'm going to turn into a lowland big-tree hunter to keep things interesting. What are your favorite big-tree hikes? Planning on spending lots of time in the MF valley of the Snoqualmie. For a considerably more lengthy trip, but bigger trees, head for the northern California redwoods. There are a number of trailheads along the Newton Drury Parkway in Prairie Creek Redwoods State Park (part of the Redwoods National and State Parks system) where in a very short time you'll be out of hearing of the road. The silence is awe-inspiring! So are the trees! Ditto the WF Foss. If I remember correctly, there's one particularly large specimen as you start heading up past Trout Lake. Obviously some large trees on the west side of the OP. 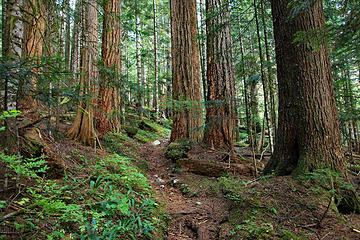 I've hike out the NF Quinault trail a few times, and there are some big trees not to far up from the trailhead. For easy access, the campground trails at Iron Creek CG on the Cispus have some nice trees. I had my right knee replaced in 2006. While I lost some knee flexion, I also lost all the pain! No such luck with my right ankle replacement, unfortunately. Heck, just hike up the Dingford Creek trail off the Middlefork. South shore Lake Quinault has some monster Dougies, and, not sure if the Willaby tree is still there, but its a jaw dropper if you can get to it. Downey Creek Trail (Suiattle River) has some nice trees and is a pretty lovely hike with a mellow gradient (aside from a quick gain at the beginning of 200 feet or so). Might be too long for you, but Big(or is it Little Beaver creek off Ross lake has some amazing trees, as does southbound PCT from Suiattle. (8 ish miles in). The Larch. 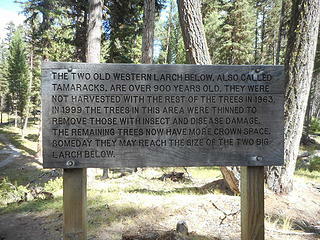 Located near Lost Lake in Okanogan County should you want a long drive. Wow, 900 years old ! There are some surprisingly big cedars on the old road portion of the Baker River Trail, just a few minutes from the car. 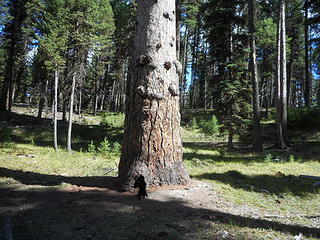 The North Fork Sauk is also just nuts with big trees. VanPelt was/is the Big Tree registrar for WA and his book covers big! trees up and down the coast, including several in WA. In the book, I love his drawings since we all know how difficult camera framing a tall giant can be. Natl. Geog. used his drawings in a big tree article several years ago. Happy hunting! I 1st met him at Lake Crescent on the Oly. Peninsula, and indeed, the nature walk from Lake Crescent Lodge to Rosemary has some doozies. PS: Early onset osteoarthritis got both my hips replaced starting at age 50 and they are a huge improvement but backpacking(loaded downhills! groan!) is not comfortable anymore and I cannot swerve/bend a soccer ball worth *&^&^ ! Grrrr.